TV Land already has assembled its gaggle of honored shows and stars for the network's eight annual awards ceremony. 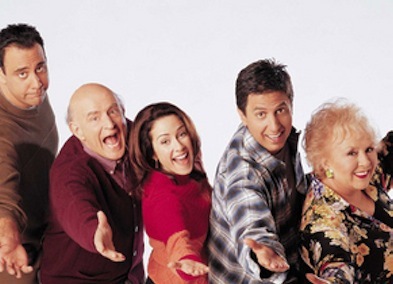 The cast of Everybody Loves Raymond will reassemble for the first time since co-star Peter Boyle's death to receive the Impact Award. Plus, Jaclyn Smith and Cheryl Ladd -- but so far not Kate Jackson -- will pay tribute to the late Farrah Fawcett while accepting the Pop Culture Award. Fox's Glee is getting the Future Classic trophy while Carl Reiner and Mel Brooks are each getting a Legend Award. The show will be taped on April 17th and air April 25th on TV Land. ***Red hot, retro-cool Betty White is getting another pair of star turns. The 88-year-old TV pathfinder will be hosting the May 8th edition of NBC's Saturday Night Live, making her the oldest ever to do so. And she'll also play a school librarian on the season finale of ABC's The Middle, which will air on a still to be announced day in May. ***CBS has rehired Undercover Boss for next season after launching it after the Feb. 7th Super Bowl to the tune of 38.7 million viewers. The show has been a breakout Sunday night hit for the network despite having to go against both the Winter Olympics and the Oscars after its big splash premiere. ***Summer's most-watched show, NBC's America's Got Talent, will be coming to Dallas on March 25-26th in its search for new contestants. The network says that host Nick Cannon and judges Piers Morgan, Sharon Osbourne and Howie Mandel (replacing David Hasselhoff) will attend each taping. The venue is The Music Hall at Fair Park, 909 1st Avenue in Dallas. For more audition information, go here. And for info. on obtaining tickets, go here.